Adam S. Wilczewski serves as the Chief of Staff of the International Trade Administration. In May 2011, President Obama called for a U.S.-Poland Economic Summit to bolster a stronger economic relationship with one of Europe’s fastest growing economies…Poland. This Central European country— an important commercial partner for the United States—was the only one to grow economically during the Great Recession. And, this has benefited the United States. In 2011, U.S.-Poland bilateral trade was $7.5 billion, an increase of $1.5 billion (or 25 percent) from the previous year; in addition, U.S. exports in 2011 accounted for $3.1 billion, and it’s an important partner for U.S. investment. 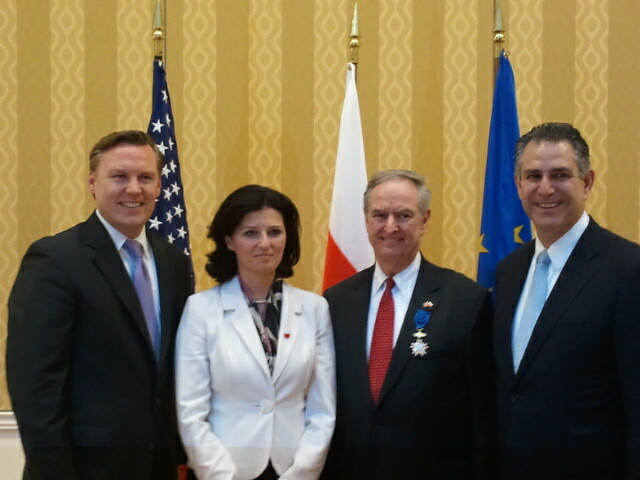 Jay Burgess (second from right) recieves the Order of Merit of the Republic of Poland with Adam Wilczewski (left), Vice Minister of State for the Ministry of the Economy Ilona Antoniszyn-Klik, and Under Secretary Francisco Sánchez. While this economic activity provides for a strong foundation for continued growth, more must be done. This is why in June 2012, the Department of Commerce will answer the President’s call for action, and host the first-ever U.S.-Poland Business Summit. Over the last year, the International Trade Administration (ITA) has been hard at work to prepare for this historic summit. Specifically, this work would not have come so far without the efforts of Jay Burgess, Director for the Central & Eastern Europe Division in the Market Access & Compliance division of ITA. In fact, Jay actively has worked to develop and strengthen U.S.–Polish economic and commercial ties for the past 30 years. He’s worked on significant Departmental programs that helped Poland emerge as a European economic power in the post-Communist era. In particular, Jay’s efforts included helping to create, establish, and implement the U.S.-Poland Economic and Commercial Dialogue (ECD) in 2002. Both governments regard the ECD as central to the close bilateral relationship between our two countries, and it will be continued at the Summit in June. Personally, I want to thank Jay for his service. This year, he was particularly helpful to me in my endeavors to help increase exports to and investment from Poland. As a lead-up to the Summit this summer, ITA led the first-ever Education Trade Mission to Poland to promote increased collaboration and student exchange among U.S. and Polish universities. In addition, I attended an event in Chicago in May focused on enhancing U.S.-Polish collaboration in small business initiatives with Polish-American Chambers of Commerce from across the country. Jay’s guidance was critical, and he has become someone I am proud to call a colleague and friend. The growing relationship between the U.S. and Poland can be exemplified by the honor that was given to Jay Burgess last night. Because of his years of support and leadership, the Polish Government elected to award Jay Burgess the prestigious Order of Merit of the Republic of Poland. The order, which comes with the rank of Officer’s Cross, is awarded to foreigners or Polish residents abroad who have rendered great service to relations between Poland and other countries and who have made outstanding contributions to international cooperation. Poland’s Ambassador to the United States, Robert Kupiecki, and the Polish Under Secretary of State for the Ministry of the Economy, Ilona Antoniszyn-Klik, presented the award to Mr. Burgess at an event held in his honor at the Ambassador’s residence in Washington, D.C. Our boss, Under Secretary of Commerce for International Trade, Francisco Sánchez, was present and praised Jay for his service and his leadership at the Department of Commerce.